Here in Hawaii, growing sweet potatoes is like growing weeds. Trimmed vines tossed aside will root and eventually form an edible tuber. The wilder areas of my yard are graced with purple sweet potato plants that have emerged from my compost. (Though admittedly, growing sweet potatoes like this doesn’t really net a big crop.) Growing sweet potatoes in pots might be a more reasonable option if you live in a different climate. But even if you live in a region with a shorter growing season you can harvest sweet potatoes. They need a minimum of 90 days between planting and frost. The trick to growing sweet potatoes is to start early so you’ll be ready to get them in the ground as soon as your soil is warm enough. I’ll be honest: I’m new to growing sweet potatoes. My family has never really loved them, so it just didn’t seem worth the effort. Then I discovered the Okinawan purple sweet potato plant (center of photo, above). Not only is it the best tasting sweet potato I’ve had, it’s the prettiest. Look at that purple! Here’s something to consider about adding sweet potatoes to your garden: They are a calorie-dense vegetable. Here’s why that matters. Sweet potatoes are planted from slips, or live cuttings. You can start growing your own sweet potato slips so they’ll be ready for spring planting, even when it’s too cold to do any outdoor gardening. Start by picking up a sweet potato from the grocery store. Choose organic if it’s available; some conventionally-grown potatoes are treated to prevent sprouting. Push three toothpicks into the sweet potato, spaced equally. Put the sweet potato into a recycled jar filled with water and set in a bright location. This will look a lot like a grammar school science project. The potato will start sending roots down into the water within a few weeks. Soon you’ll see green shoots start to emerge from the upper portion of the sweet potato. These are the beginnings of your summer sweet potato crop! When your soil reaches about 50 degrees F, it’s time to plant sweet potatoes. 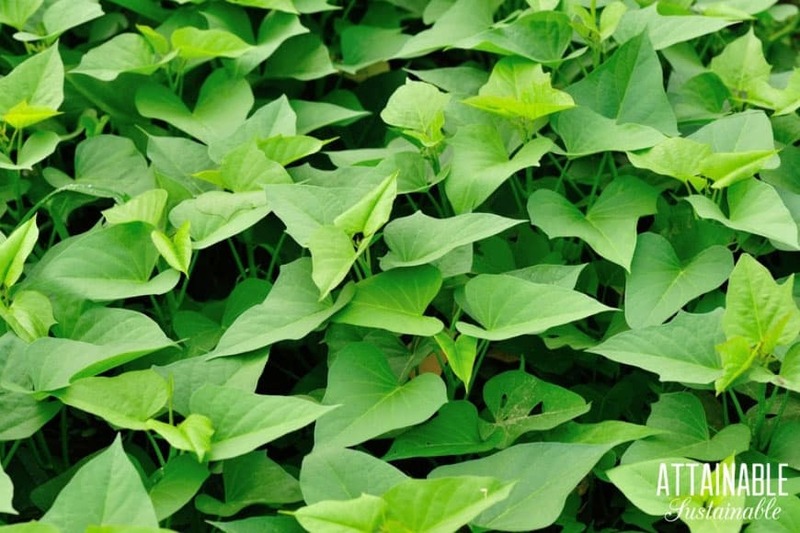 Cut 10″ to 12″ lengths of sweet potato vine from your “seed” potato. Trim leaves from the lower portion of the slip, leaving a couple of leaves at the tip for photosynthesis. Plant each slip 6″ to 8″ deep, making sure that at least two leaf nodes are completely buried. I met one grower who actually plants a little bouquet of five of these slips per hole. Others plant just one. Both methods seem to work. If your region is really late in warming up, you can start rooting your slips indoors in pots filled with potting soil following those same steps. Keep the soil most but not wet. When warm weather finally arrives, you’ll have rooted cuttings to move out into the garden. Plus, those sweet potato leaves are edible! I’ve had good luck growing sweet potatoes in pots. In particular, they’ve done well in grow bags. Sweet potatoes form tubers along their roots. Those roots can extend a good way from where you originally planted the sweet potato slips. 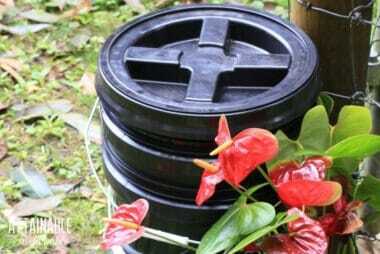 Growing sweet potatoes in pots allows you to keep them contained to a specific area. 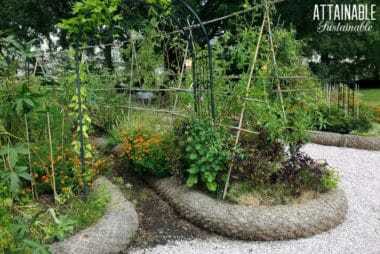 This also allows for harvesting without having to dig up a large area in the garden. One of the more common varieties of sweet potato here is the Okinawan purple sweet potato. They are just stunning. We talked about this variety awhile back on Facebook and lots of people asked where to find them so they could give them a try. I just discovered that Hawaii Veggie Farm ships Okinawan purple sweet potatoes by the box. I’ve never ordered from them, so I can’t give you any feedback on the company itself, but it might be a fun way to try something new in your garden! I just ordered 12 lbs. from the company you mentioned so I’ll let you know how they do! Thanks for all the info. 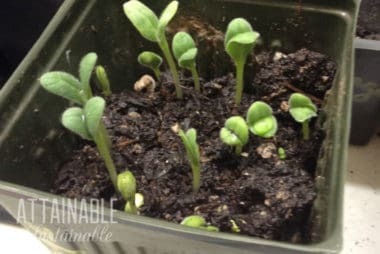 How funny–my youngest and I did the sweet potato project this winter, just for fun. My family doesn’t really like sweet potatoes, either, so I never plant them, but now I’m dying to try the variety you mentioned. Ironically, I bought an organic sweet potato, and it never sprouted. The conventional one did, but it didn’t grow well. Isn’t that weird? I should have gotten it at our Farmers’ Market instead of the grocery store. This is my second year growing sweet potatoes. Last year I harvested a great amount of purple potatoes, this year I am trying to sprout a Covington (orange) potato but even though I got it at the farmer’s market and it supposed to be organic, it’s not sprouting…. I think the temperatures in my house were a bit too low for it. Luckily, a friend gave me a few of the Hawaiian purples you mentioned, I am so excited to try them! He also said they are the best he ever tasted. Hopefully they’ll grow good here in the South. My mom is full Okinawan so that’s why she’s been trying to find the Okinawan Sweet potato! Please ask your mother if Okinawan purple sweet potatoes have a purple skin and flesh or if they have a tan colored skin and purple flesh, like the ones grown in Hawaii? Thanks! Okinawan sweet potatoes actually originate from North America and not Japan. They were brought to Japan from indigenous tribes from North America. I’ve not done it, but I’ve seen lots of people (online) doing it successfully! We grew sweet potatoes in containers a few years ago. We plan on growing them again this year now that we’re settled in a new place for a while. PL advise as to how I can grow a pretty plant from a bottle in my living room?What steps will I have to follow? Just starting a potato in water (as you see above) will net a pretty substantial trail of (edible) vines. If you wanted to keep it as a houseplant long term, though, I think I’d transplant into a pot with soil. Fun project! It will still grow a sweet potato, but you don’t have to harvest it! You can just grow the plant in a hanging pot and harvest the leaves for stirfry and salads ….. edible and tasty, and easy greens to have when there is not much else around. By chance would you know what the name of the red sweet potatoes you have in the picture and where I could get a few of them so I could start slips from them – any information would be appreciated. I’m sorry, I don’t! The purple/white ones are an Okinawan sweet potato. Those with the red skin/purple flesh are not as common. I’ll ask next time I find them, though! I agree with you about those okinawa sweet potatoes! They are the BEST!